Welcome to the Danbury, Iowa web site. 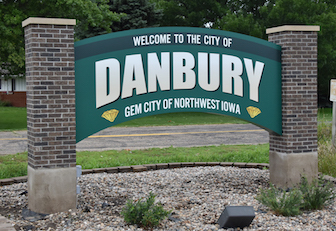 Danbury is located in northwestern Iowa, in the southeast corner of Woodbury County. The main features of this site are listed on the left side of the screen. You are currently looking at the Home page. This is the page that will be displayed each time you visit the starting page of this site unless you specify a different default page. You can do this at the bottom of this page. The Announcements page contains information that might change frequently. Contents include school announcements, happenings and events around town, sports scores, election results, and any other information that needs to be given in a timely fashion. The City of Danbury page contains information about the town itself, its residents and businesses. It also has information about city hall and goings-on there-in. The Danbury Review site is normally updated on Friday evenings. The Nuns on the Run page is dedicated to Danbury's very own group of traveling "sisters." Information includes who they are, what they do, and a schedule of appearances. The Preview Printing page is the place you want to go if you need pictures taken, pictures printed, buttons, posters, invitations, thank yous, or videos made, laminating done or many other services done. The Local Weather page contains weather information gathered from our very own weather station. It is updated every 5 minutes so you can view current weather conditions as well as check the history. This information is also fed to the Weather Underground web site which includes radar and many other cool features. If you would like to change the default page that is displayed when you visit the Danbury web site, choose it from the pop-up below and click the "Set Default" button. Your web browser must support cookies and they must be enabled and allowed for this site.